The Haiti Healthcare Partners is a mission of the Westminster Presbyterian Church in Westlake Village, California. This 501(c)3 organization supports a clinic located in Cherident within the remote mountains of southern Haiti. Through the gifts of HHP, people in the mountains continue to receive medical care. The clinic is fully staffed and opened throughout the week. If you would like more information about this ministry, contact Martha Miller. The mission of this organization is to train and equip mission teams to share the gift of clean sustainable water with communities in need. Not only are villagers given access to purified water, they are educated in its importance. Water impurities are responsible for most illness and death among children in Haiti. Clean water brings much promise to each community blessed by this mission. Chris McRae, a member of the HEF board, serves as the Haiti liaison. For more information, visit the Living Waters for the World website. Solar Under The Sun is a ministry of the Synod of the Sun, under the Presbyterian Church, USA, designed to provide solar power to nonprofit groups in communities with great need -- no matter where they might be -- to help them alleviate hardship while also becoming better stewards of God's green earth. 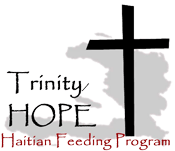 Trinity/HOPE raises money and administers programs to provide hot nutritious daily meals to the children, teachers and cooks in Christian schools in Haiti using established and successful processes. If you would like to know more information about this mission, please visit trinityhope.org.